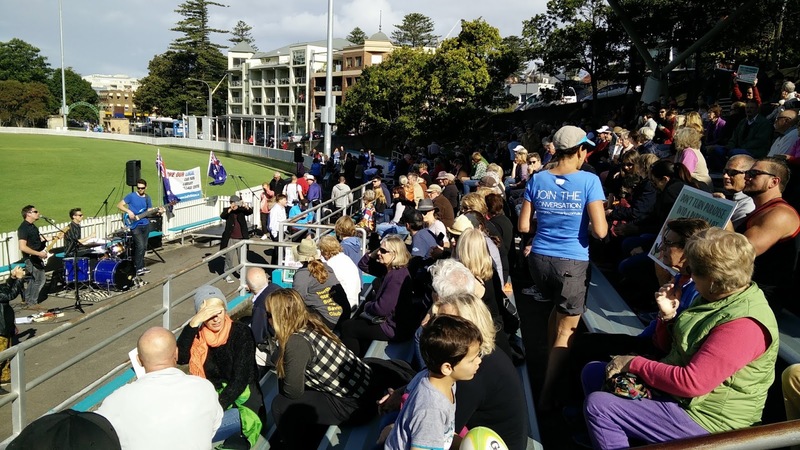 Councillor Candy Bingham is always a voice for the people’s view of what is good for Manly. 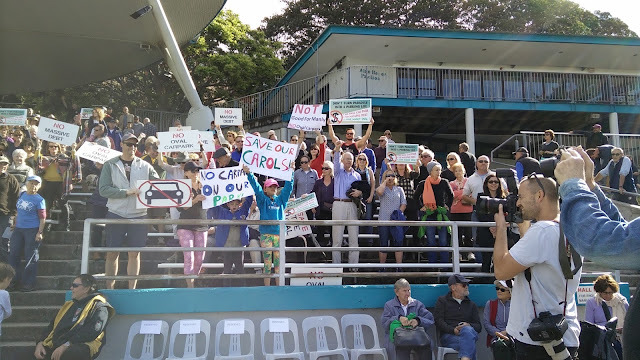 Sometimes opposing the Council’s stance on redevelopment in the area she engages the people who live and pay the rates into the council coffers. This protest was no exception 500 – 600 people turned out in unpredictable weather to listen local super tight trio Ulterior Motive warm up the crowd with some great tracks from the 70’s that had the Baby Boomers singing along to Sweet Home Alabama etc. culminating with a rendition of Joni Mitchell’s Big Yellow Taxi with emphasis on the “Parking lot”. We used minimal kit 3 Behringer B112w powered Speakers with a Eurorack mixer, Beta 58 and Sm 58 mics. The guys turned up and played and we quickly worked out that playing in front of a roofed Grandstand had a unique effect on the sound especially with the speakers on high stands filling the space with surprisingly clear and warm sound from such a small improvised rig. The three band members who are all professional muso’s commented on the sound from the small speakers i had chosen to use , mainly because of the weather idecided to use light small speakers that could handle some rain and punishment and not cost the earth to replace. I have quickly found the Behringer B112 speaker a versatile reliable speaker with around 14 hired each week some coming back looking like they had been attacked by a group of Kindergarten kids, super reliable with one tweeter out of 14 blown once in a year of hire that works for me! Compare that with 14 JBL speakers and you would have a hard time keeping your running costs that low. The event was a success for all concerned and we packed away dry and without incident. Ulterior Motive are a great band for the thinking persons wedding or party, playing popular diverse quality music which can be hard to find these days.